Encouraging London to rethink its idea of timelessness, Natalia Miyar understands that an interior needn’t be free of colour, statement furniture choices or one-dimensional to future-proof itself against changes in trends. Style, in all of its forms, is eternal. Launching her new studio’s portfolio with great promise, the aptly named Dimensional project schools in matters of colour, texture and form. The five-storey home, found in London’s St John’s Wood neighbourhood, succeeds on account of its intrepid design choices – a barefaced rebellion against the capital’s love for all things grey, simple and inconspicuous. Captivating colour combinations (olive green with blush pink, verdigris with burnt orange and royal blue, et al), clever furniture selections (an ultra-reflective cobalt resin dining table is a favourite) and inviting textures (in the past, Natalia has correctly observed, “Look closely at nature and you rarely see flat surfaces”) are the trifecta of this space. 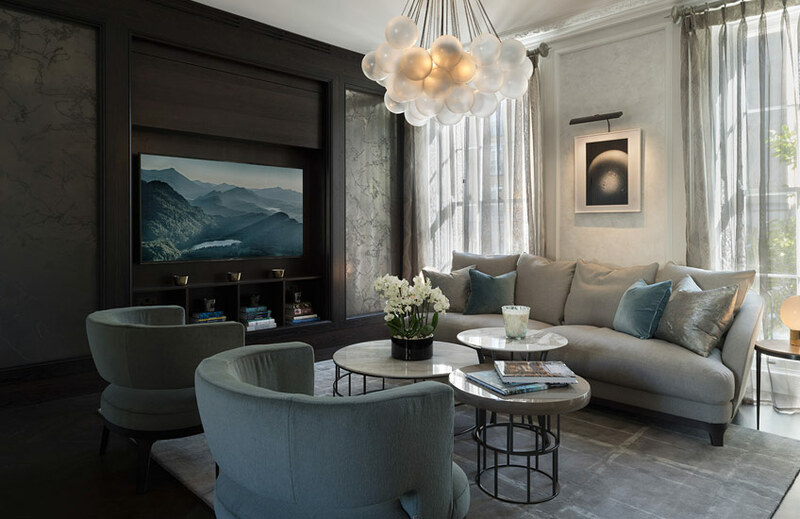 Nothing less than perfection could be expected of Katharine Pooley – the interior design doyenne – and perfection permeates into absolutely ever corner of her recent Mayfair project. Palettes are fresh but rich; existing architectural features are enhanced; and furniture choices are on point. Throughout the home, the designer pairs vibrant azure tones with stark whites (for an opulent take on the classic colour duo) and unique light installations and furniture pieces (from selenite halo pendants to a blue onyx-topped coffee table) pepper the space. Serene neutrals and handsome monochromes cloak the master suite, secondary bedrooms and informal living room for a well-balanced and liveable (albeit wonderfully grand) residence. 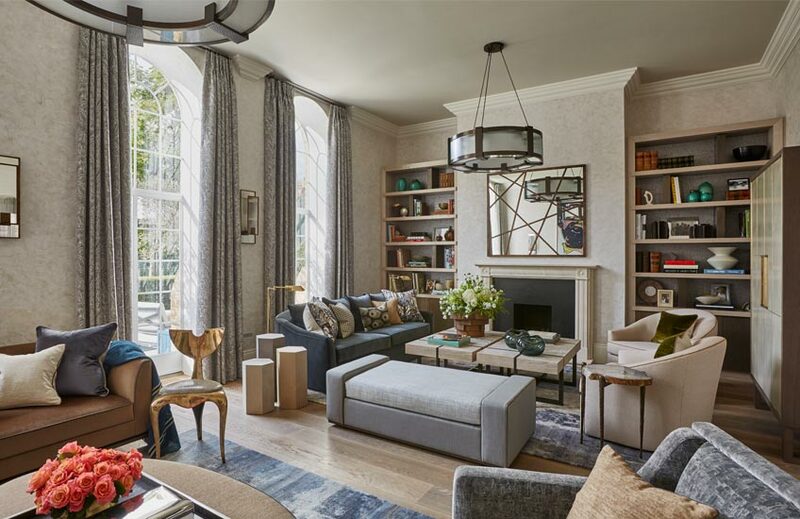 A welcoming family home with more style than we can hardly handle, Helen Green’s Chelsea project is a refreshing change of pace for London interiors. Characterised by stately bones, the property itself is a solid starting point. Its incredible natural light (unheard of in a town where light is at a premium) illuminates the space thanks to full-height arched French windows in the living room and an open stairwell and entryway. Thankfully its interior design is an equal match to these covetable architectural qualities. Pale woods (in favour of the more traditional dark tones) open the space up; brass and bronze accents (like the ultra-chic Whaletail Chair by Mark Brazier Jones) abound over more glitzy gold or silver, giving the space an earthy, natural feel; and textural wallpaper, curtains and rugs are the foundational building blocks of what makes this project so successful. A game-changer in the capital’s styling to say the least. 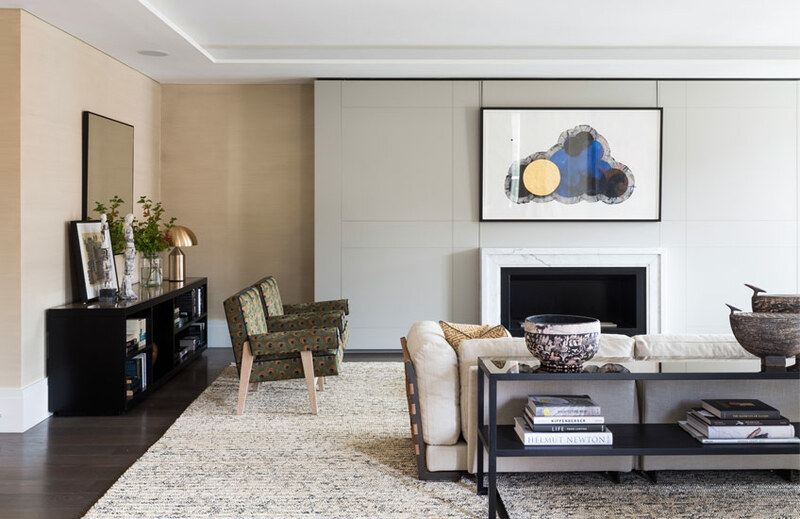 Balancing old and new, Peter Mikic’s Dawson Place creation is a thing of beauty for those torn between traditional and modern tendencies. Satisfying those traditional yearnings is a parquet floored living room, green marble fireplaces, decorative cornicing and key furniture pieces (like the office’s elegant cabriole-legged desk). The modern element is provided in the form of Marco Zanuso Senior lounge chairs, a ginger Streamline Moderne buffet and Art Deco TV cabinet and a 1960s Murano glass pendant, all anchored against modern champagne grey walls. Pops of colour and warm wood panelling in the home’s informal areas suggests a cool Mid-century modern aesthetic as a suitable counterbalance. Explore the project tour here. 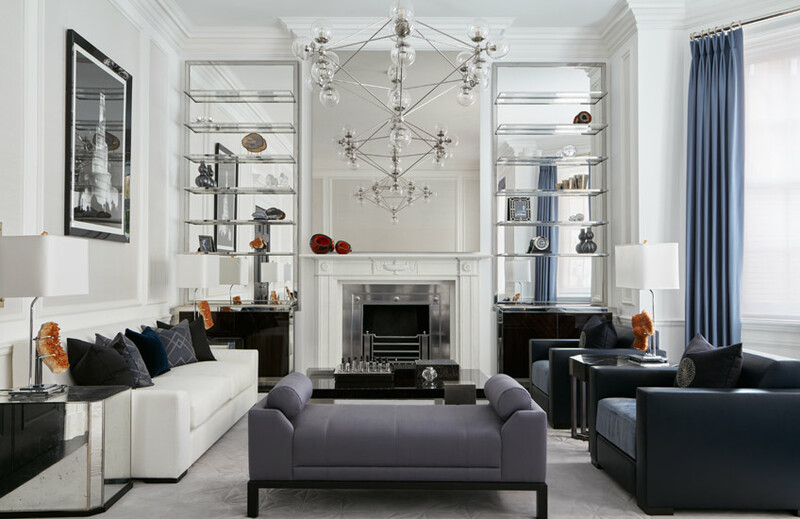 Situated on the iconic Chester Square, Laura Hammett’s newest townhouse project epitomises luxury London living to the nth degree. 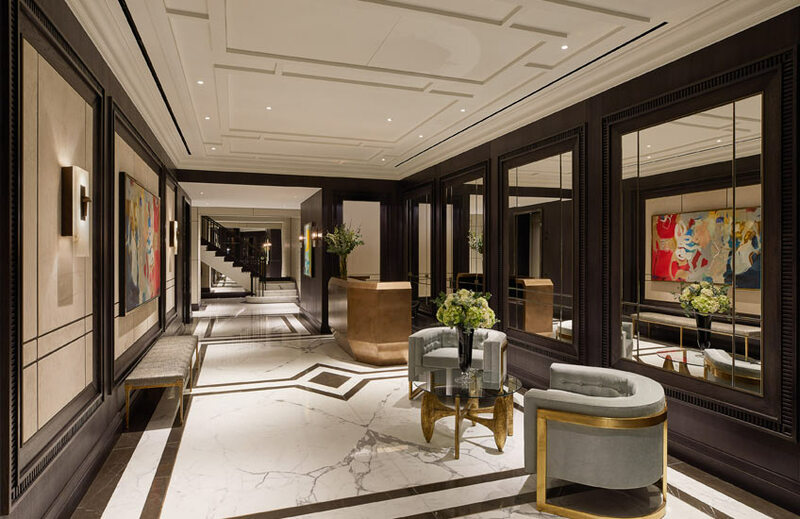 Its elegant styling takes the form of floor-to-ceiling windows swathed in swagged drapes, a grand drawing room with quintessential millwork and restored fireplace, beautifully matched marble flooring and considered spaces (even the staircase reading nook is well-appointed). 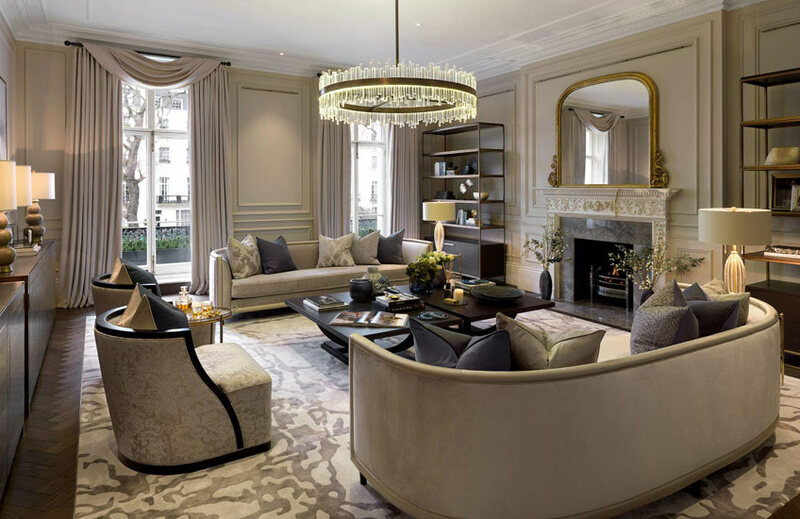 Armchairs upholstered in fine damask prints and sofas in silk and suede fabrics, freestanding silk button-tufted headboards and decorative leather-clad cabinetry are just some standout pieces from the property’s collection of £1 million bespoke UK-crafted furniture and fittings. 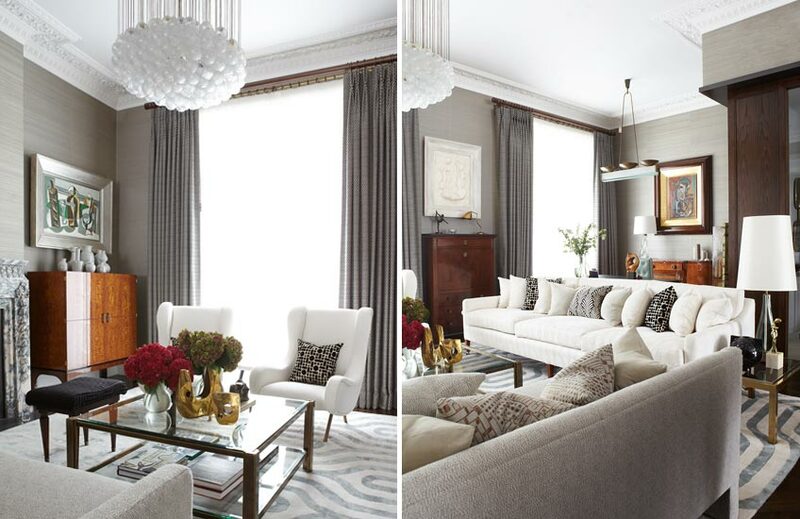 Gilded mirrors, Bella Figura chandeliers and soft pink accents offer a charmingly glamorous finish. Evoking the ease of Californian design with its penchant for Mid-century silhouettes, relaxed fabrics and casual styling, Studio Ashby’s airy Cheyne Terrace project offers an interesting style not regularly seen in the capital. The apartment blends earthy tones with seemingly untreated woods and organic forms (including a custom burr elm coffee table crafted from a single piece), all rounded out by a careful eclectic vibe. Deep green marble and warming wall coverings add a luxe touch to the aesthetic which straddles Scandi and Mid-century styles. Much of the apartment’s inspiration comes from its Thameside location (its curved sofa mimics the winding curves of the river down below) and the Abstract Expressionists of the Tate Modern’s permanent collection.